After my experience in using Aperture 3 to make my first Apple photo book, I wondered, “Is there a difference in the quality of a photo book printed with iPhoto versus Aperture 3”? Despite using iPhoto to organize all my photos, I have never used my iPhoto to make a photo book. I guess I just got used to making books with the first company I tried (MyPublisher), but since then, I’ve been venturing out a lot more (as you can probably tell). 1)	Aperture 3 offers much more advanced photo editing tools. You cannot compare the handful of basic iPhoto’s editing tools with the extensive options Aperture 3 gives you to make precise adjustments. iPhoto works fine for a quick fix of snapshots, but is not for the more serious hobbyist and definitely too limiting for pros. 2)	Aperture 3 offers an easy way to edit your photos en masse. (A big advantage over Photoshop is how the workflow “flows” – I didn’t realize how tedious it was to open each individual photo in Photoshop in order to do edits. Multiply that over 300 photos and it can get very time consuming! It was nice to have all the photos right there and easily accessible to edit. A bonus was to be able to readily access the editing tools while working in the book design software. 3)	Aperture 3 offers fully customizable layouts – a must for anyone who’s into making photo books like me – iPhoto doesn’t have that capability. 4) Aperture 3 does non-destructive editing – if for some reason you want to get back to your original photo (or photo book version), you can do that and easily backtrack and undo any edits. 5) You can save your book design in Aperture 3 as a PDF and upload it to any photo book company – you’re not restricted to printing it with Apple as is the case with iPhoto. Aperture 3 is clearly the better program for editing and book creation (duh), but it is $199 more than the ole’ standby iPhoto which comes on your Mac, so you have to decide for yourself if the features are important to you. Try the free Aperture 3 trial to see for yourself. -The books are all printed at the same production facility. -I had read that iPhoto does a pretty aggressive downsampling or compression of photo book files as they are uploaded for printing, but that Aperture’s compression was less. I asked Apple’s customer support if that was the case, and while they didn’t give specifics, I was told that the compression rates for iPhoto and Aperture do differ and that there was no way to adjust that. However, the representative stated that the different compression amounts do not affect the print quality of their books, prints, calendars and cards. If you’re interested, check out my earlier post featuring my detailed Apple Aperture 3 photo book review. See my Aperture 3 overview. These photos were taken of the new iPad we just got today and of course I had to see how my site looks on it! Hmmm…wonder what they’ll say about the iPhone later today??? Hi Joy! I’m working on my honeymoon book now too! (bridal shower and rehearsal dinner are on the list too…) It was really hard to find the answer to this question on the internet and forums, so I just contacted customer service and asked follow up questions for clarification. They were really prompt to respond, so I’ll give good marks to Apple for customer service. I really liked how my AdoramaPix book turned out – it is a very different product from other photo book printers I’ve tried to date. Let me know how you like it. I haven’t tried Smilebooks myself, but the plan is to add more photo book companies as I go along. There are actually several that I have on my list to get into the database (including iPhoto). When you say your Smilebooks book was “okay” – do you mean print quality? If you have more info on that you want to share, that would be great. I’m glad that you’ve found my posts helpful – hope you’ll visit often! To be fair when I say my bridal shower album was “ok” is that I wish I put a little more effort. I did 2 8×8 books, one soft and one hard cover. The one thing I didn’t like on the hardcover was that the little picture applied was a sticker, and looks like a sticker. But for a review of Smilebooks, the print quality was very good and the paper was a good thickness. Making the book with their program was fun. So I do recommend that you try them out and add them to your list. I will keep you updated on what happens next. I am taking my time on my projects. I will definitely be visiting often. So many companies to try – so little time 🙂 Yes, please keep in touch! Your website is my dream come true. I have so many books to make and am so stuck! I don’t know where to turn. I figured I’ld start trying them all one by one, but boy it takes a lot of time. I did make a shutterfly book a while ago, which came out nice, but the paper a little thin, photos pretty good, not great. I did get a 30 day trial of Aperture and couldn’t get much done. I finally broke down and bought the program as I kept hearing and seeing it has the best and most customizable book design. Hadn’t tried the apple books yet, tho seen them in the store. Looks sort of the same as Shutterfly. I’m almost finished with an iphoto book, loved hearing your comparison. They do have fun templates, but not very customizable. I will probably switch to Aperture after this one. I don’t like designing online, too slow, or at least it was a few years ago. Have blurb software and publisher. Wasn’t crazy about publisher books, but may try again. Love the idea of a heavier matt paper. Will have to check that out. Anyway, I think the idea is to not be perfect, but just to move on and start making books! So glad you’ve got a good start…just wait til you have kids!!!! Thanks again, will check out more of your posts!!! Thanks for commenting! Yes, there’s so many companies out there – it can be confusing. I basically started making photo books by going online finding MyPublisher and then I made several books through them until venturing out to Blurb, Snapfish, Mpix. Then the rest is history. Off the top of my head, the most flexible design software I’ve seen so far is from Aperture, AdoramaPix and Photobook America. Picaboo and Mixbook also have a lot of flexibility too. I like different companies for different reasons which you’ll see in my reviews. If you scroll to the bottom you’ll see links to all the reviews there so you don’t have to click on the company logos. At some point I will add ratings and do more comparison posts, but it may take a bit of time…til then I hope my reviews will be helpful and good luck to you in your photobook making! What a nicely organized site! 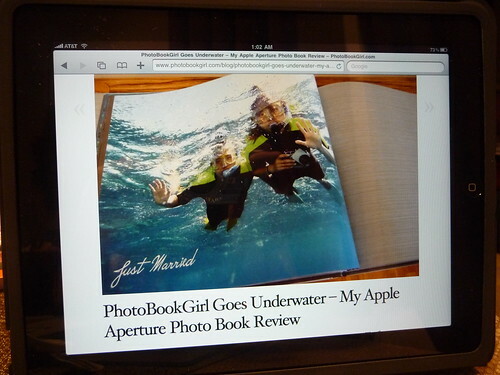 For the last 2 Christmases, I have made several books with iPhoto and sent them to Apple. They came out nice. Everyone was impressed with them. The paper is flexible, not like a photo or stock type paper. I was a little frustrated by the limits in the layouts. As usual, what Apple supplies is well designed so nothing is going to look bad, but it’s not as customizable. I think I am going to try some other services and see what happens. Thanks for contacting Apple. I wish they had more information about their photo services. If I use aperture and export to a PDF to print with another company, do I need to find one that offers the same book size? Will my two page spreads work with a layflat book someplace else? I really wish Aperture offered layflat! I currently use iPhoto and was contemplating Aperture so your review was very helpful. Thank you. I also have two questions. 1. Mpix, Blurb etc??? – Do the quality of the pictures in the photobook match that of 4×6 photos from shutterfly? 2. And have you tried WHCC? Thanks so much for this website. I just made a photobook and tried out apple iphoto book and mypublisher. We went for the glossy page option with my publisher, which was extra. Don’t know if it was that that made the difference but the quality was noticeably better in my publisher. The images were sharp and photo-quality whereas the iphoto ones were grainier and ‘home printer’ quality. Iphoto software is nicer to use and customise so might be better for a scrap book type thing where the quality doesn’t matter quite so much but for sonething where you have professional quality photos I’d go with my publisher every time. Thanks for your recommendation fir my publisher – it really helped make the decision. Have you ever known anyone who created a photobook completely within Lightroom 3? I have found anything regarding printing in any way to be frustrating with Lightroom, but it would make my life easier. Also, I agree with you so much re Photoshop and doing things 300 times… I am not good at making droplets, though that would take care of a lot of the drudgery. Any of your thoughts would be greatly appreciated! Thanks so much for this information. I’ve been wondering if there was a difference in quality and found your website by googling that question. I used iPhoto for printing a photobook this past December and was not pleased with it – mostly because of bleed over on several facing pages. My photos also printed dark. Hoi. Thank you for writing this. I appreciate your effort. I am adding sources to offer my own clients, and I was searching for this info relentlessly. Non archival is worrysome. I know it may not get lots of direct exposure, but will the print hold up to the acid and oils in the hand? will it fade and run? I think aperture offers a nice design package, but since the apple prices are ubiquitous, I dont have any room for profit except for layout. This hurts me when I shoot gigs for printing expenses only.And I look for other options in quality, so I am really interested in that price calculator and your publishers 180Lb papers. I think I would like to add this to my options for my clients as I grow my business I want the BEST quality, or else they could go to wall mart.The DPI is a consideration. Curious about the iphoto print formats. hmmm. Im also curious as to thier photo paper quality. I have one local printer that is archival and competitive but i have to spend considerable time editing, but, I know its solid product. Do you know what company apple uses for their prints, im sure they are not making them in Cupertino. If you can find out and post it here, Id love to know this info. I’m not sure what company Apple uses for their prints. My book did come from CA though, I can’t recall the exact city on the packaging. You may be interested in this post since you asked about paper quality: http://www.photobookgirl.com/blog/photo-book-paper-quality-compared-photo-book-company-prints-best-paper/ Hope that helps! I have been using Aperture 3 and Apple print books for a few months now. Yes they are pricy, however by the time you add paper, ink and some sort of portfolio or picture book to keep the photos in, the option makes sense. I am using the Extra-Large Hard Copy books and the quality is really good. I am going to give several different books away for Christmas as gifts. Each book ranges from $49-100+ depending on the number of pages. There is some lag time in getting books back from Apple, however printing takes time. Also, I live in Michigan and the books have come out of Oregon so geography is not in my favor. Aperture is a really great program and does a nice job of cleaning your photos, allowing you to stamp your pic’s in places, your people in faces and interfaces very well with i-photo. I HIGHLY recommend using you tube or getting a self help book for Aperture as it is as simple or complex as you want it to be and why not learn about the program. I have converted from Photoshop to Aperture to get the value of the database and book printing. Your posts are great, thank you for the valuable information and confirmation. I have not tried print books form Wallmart, Cosco or other less expensive websites, and probably won’t. The “buy book now” button just is too easy. Gotta love Apple for ease of use. Yes, I’m a Mac junkie myself – ever since the Apple Performa I had about 20 years ago 🙂 Too bad their books never go on sale though! I’m reviewing Lightroom 4 now. Was excited about the photo book feature, but after downloading the free trial, am finding out they don’t offer custom sizes! Why would they do that? Argggghhhh! You should be able to export your book as a PDF and then print it with any company that will take PDF files. I know that Blurb does that. Not all companies will take PDFs. Blurb is one of them. Best!